Almost exactly one month after the Boston Marathon terrorist attack, His Beatitude Archbishop Ieronymos of Athens and All Greece visited the site of the attack at Boylston Street, where an ad hoc memorial has been created by the thousands of visitors. His Beatitude was accompanied by Archbishop Demetrios of America, Metropolitan Methodios of Boston and the other members of his entourage from Greece. The presence of the Orthodox Hierarchs and clergymen at the site, naturally attracted the attention of the hundreds of visitors in the area and the various media outlets, who report and broadcast from that point daily. It was an emotional moment for all present, as Archbishop Ieronymos slowly approached and laid the wreath next to the white wooden crosses bearing the names of those who tragically lost their lives that day. Together with Archbishop Demetrios, Metropolitan Methodios and the other Hierarchs and clergymen, they recited a short memorial prayer and chanted in Greek and English, May their memory be Eternal. His Eminence Archbishop Demetrios of America addressed those who had gathered around them, and were watching and taking pictures, to explain and offer an understanding of the memorial prayer. 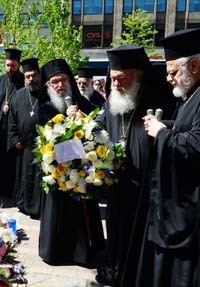 He presented Archbishop Ieronymos, and said that he is coming from Greece, the place where the Marathon started, and while he is visiting Boston to receive an Honorary Degree, he felt compelled to come to this site and place a wreath as a symbol of memory and honor to the victims of this great tragedy and to offer prayers for their souls and the well-being of their families. Following these remarks of Archbishop Demetrios the crowd, gaining a better understanding of what he had witnessed, applauded enthusiastically. Earlier in the morning, the Primate of the Church of Greece, Archbishop Demetrios, Metropolitan Methodios and their entourage visited the Museum of Fine Arts of Boston. They were welcomed by Archon George Behrakis, who is a Member of the Executive Committee of the Archdiocesan Council, a philanthropist, and on the Board of the Museum of Fine Arts of Boston. The “George and Margo Behrakis Wing” of the Museum was named in his honor and through his substantial donation houses a great collection of Greek, Roman and Egyptian Art. Archbishop Ieronymos toured some galleries of the Museum guided by curators of the museum’s exhibits. He had the opportunity to see a set of icons not yet on public exhibit, by an unidentified Cretan-Venetian artist of the 15th century which consists of an icon of the Mother of God, holding Christ in the center, three icons of Sts. Christopher, Augustine and Stephen, on the left, and three icons of Sts. John the Baptist, Nicholas and Sebastian, on the right. The tour continued with the Behrakis Wing and sculptures and statues of Greek antiquity. The Museum and its Director Malcolm Rogers hosted a luncheon in honor of their guests. Among the other participants were Andrew Russell, Director of Institutional and International Relations and Greek-American Betty Georgaklis, who works with MFA in fundraising and Greek-American Community relations. Later in the afternoon His Beatitude Archbishop Ieronymos visited the Annunciation Greek Orthodox Cathedral of Boston and was welcomed by the Cathedral’s Dean the Very Reverend Dr. Cleopas Strongylis and his parishioners. Metropolitan Methodios hosted a dinner, in which some of the Metropolis’ key people, clergy and laity, were also invited.